"DO YOU REALLY WANT A BOXER?" 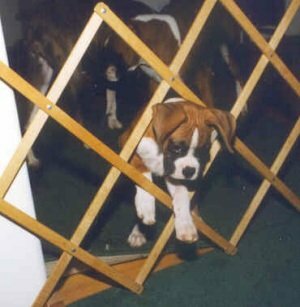 Whenever I speak with people interested in Boxers as a family pet, I give them all the negatives about the breed. And, there are more than a few. People read all the literature on the breed and it gives a lot of good information. But most literature on any breed, does not give you the whole picture. I encourage people to be aware of the kinds of things puppies and dogs do that are not so appealing. The Boxer is not the type of dog for everyone. They are a guard breed. Having been bred to work alone they are very intelligent, but also free thinkers. In other words they don’t always see things the way we do. This is a powerful dominant, arrogant “make my day breed” take charge breed. They have a strong prey drive. 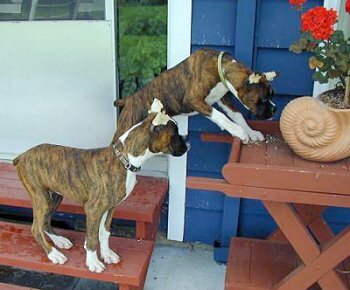 The boxer considers everyone needs to be tested as to their worthiness to be the leader of the pack. If you are not prepared to be that leader and to demand respect then do not buy a boxer. Breeds that were bred to work without instruction from man, had to be intelligent, quick, and independent. This breed is also stubborn, strong, agressive and tough. 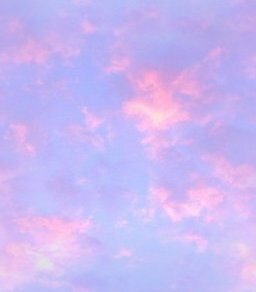 Because of the kind of work they did, those qualities were a necessity. Breeds like retrievers, the herding breeds and many others were bred to take instruction from man. They do this very well. As a family pet they are usually more cooperative. Boxers and small children are wonderful together, after the boxer has been trained and the children have been trained. Until the time he is an adult he will not always behave appropriately around small children. During the time he is growing up, and the children are small, there must always be knowledgeable adult supervision. Toddlers and small animals cannot portray leadership. So the boxer picks them to dominate first. As puppies they want to play, they use their teeth, they jump up and their bodies grow way faster than their brains. They maul and pounce on children and this is play, but also young puppies show and try to gain dominance. 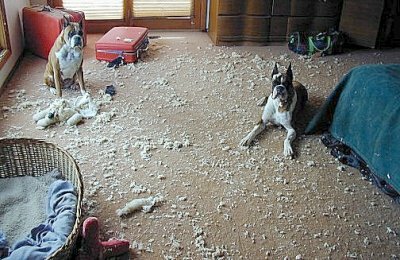 If you are bringing a puppy in the house with children under the age of six you will have one of the most challenging training situations. If you have a new baby or are expecting, you should wait or purchase a fully trained dog. And, even a fully trained dog will need to have some training with his new owners so he knows who is the pack leader and that he must respect and respond to the new humans. When I say trained. I mean a concentrated effort for several months preferably with a professional instructor who is familiar with the breed. Trifecta Dog Training Center Not all of them are. Training shows the dog who is the leader and who he shall follow. Training teaches respect and creates a working relationship with dog and owner right from the start. 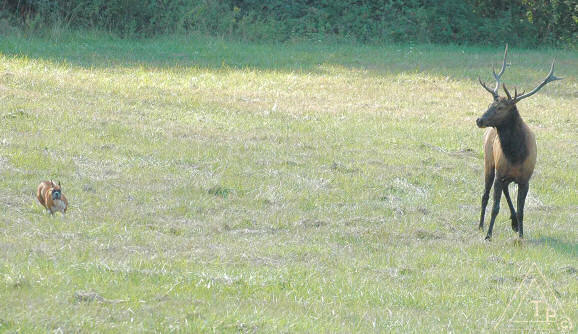 Training gives confidence and trust to a dog who may have a softer temperament. Most people wait too long to do concentrated training. 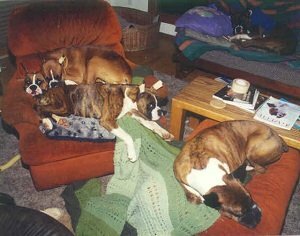 Many do not get the appropriate type of instruction to train a boxer or any of the working, dominant, take charge breeds. Training with food treats is perfectly appropriate to teach a behavior and as a reward. But if you are continually using food as a bribe you are not truly training the boxer. He is actually training you. I feel it is mandatory to start training your puppy as soon as he is comfortable in your home. Usually a few days of adjustment to his new home is sufficient, especially if he is seven weeks or older. It is a good idea to find a trainer in your area and start going to a puppy class. If no puppy, class is available; there are several books and tapes on puppy training. Beware of so-called "puppy socialization." 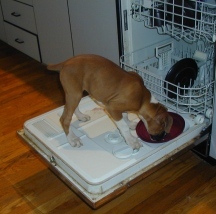 Sometimes boxers learn to dominate in puppy socialization classes and that is counter productive. Start crate training immediately. If taught to sleep and nap in his crate the boxer will feel it is his den and can be in the crate when appropriate for his safety and the safety of your environment. House training is much easier if you have a puppy who will sleep in his crate. Boxers are comedians. But they have maintained the ability to do many kinds of work. Including search and rescue, hearing, Seeing Eye and therapy dogs. I feel a neutered male makes the best family pet. However, for families with younger children the females (who seem to mature faster) can offer a wonderful matronly temperament. Please take your time to meet the breed and talk to reputable breeders. Please do not buy from a pet store. If buying out of the newspaper. Meet the parents, Know the right questions to ask. Be discriminating. 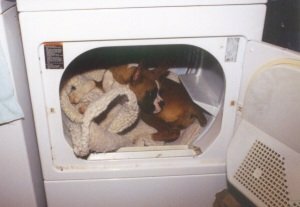 Most reputable breeders will always maintain ties to the puppies they produce. They will question the buyers about many different aspects of their life and home. They will be happy to answer questions and offer limitless help. They will give some sort of health guarantee. All offer care instructions, including recommended food and a sample, registration papers, health record, and a contract. Many of us who love the breed do have a litter of puppies occasionally. We are usually breeding for ourselves because we want another show or competition dog. In an average litter of 5 to 7 there will only be (if you are really lucky) one show prospect. The rest go to families we feel will give them a loving, permanent safe home. 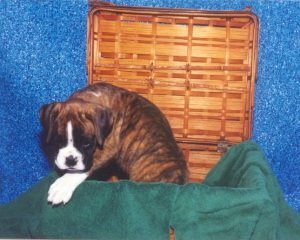 Boxers are loyal, protective, affectionate and playful, If they are properly trained they make wonderful family pets. But training any dog is work. It demands consistency, lots of repetition, patience and praise. 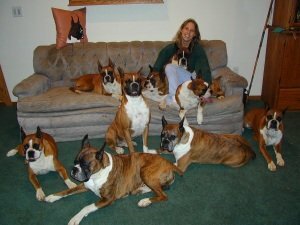 Most new boxer owners fall prey to their wonderful loving expressions, their amazing power of intuition, their affectionate and their silly antics. Before the new humans realize it the new boxer is calling all the shots. 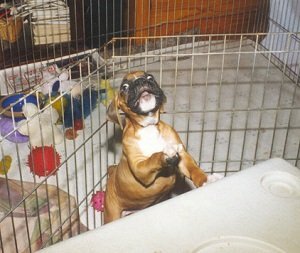 Serious training with consistent and reinforced rules, need to be established form the moment the boxer enters the new home. Whether it is a baby, young adult or rescue. If you cannot commit to giving this puppy or new dog, a lot of attention and training, then wait till a time in your life when you can. Adding a dog to your family is just like adopting a child. Below The Remains Of Snoopy….courtesy of Carsone 7 months, Lola 2 years, Dusty 8 YEARS & still a puppy. Pictured Dusty on the left, and Cosmo, innocent because he was outside. He wanted to be in the picture since he didn’t have any of the fun. Check out some free tips to start your dog training. Moochie was supposed to be in the North pasture. I saw the Elk in the South and thought I would shoot some pics. None of the other dogs in the North new the Elk herd was out there. 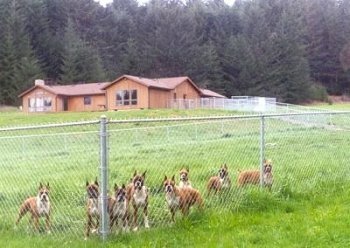 Even the boxers in the fenced compound didn't know. Fortunately Moochie broke off when I told her to. Link to a video dipicting more boxers being boxers. Actually they are playing with an Elk. Below a link to the contents page. A brief description about all the Trifecta pages. ************* The link below goes to the home page of Trifecta Boxers. For more pictures & information about dogs and training click the button below.